BLUETOOTH 4.1 EARPHONES TECHNOLOGY − Easy and fast pairing with smartphones, tablets and other bluetooth enabled music devices. 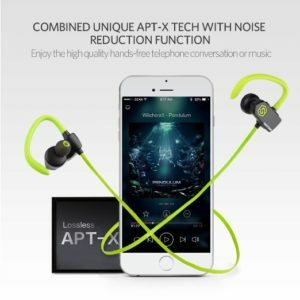 UNIQUE APT-X & NOISE REDUCTION FUNCTION − SmartOmni loss-less music wireless workout headphones Offer you impressive dynamic sound. And provide better noise isolation , you can enjoy high quality, hands-free phone conversation even on the street or inside shopping mall. EXCELLENT BATTERY PERFORMANCE − Up to 6 hours of continuous talking / music time and up to 180 hours of standby with a single charge, so you have less time charging and more time doing. SWEAT-PROOF DESIGN − Ideal bluetooth workout headphones for people who like doing exercise while enjoying music . LIGHT WEIGHT − Does not cause any burden to the ears, thus providing lasting wearing comfort,match your active lifestyle like running,jogging,cycling,driving,camping,hiking gym exercise and other outdoor sports.